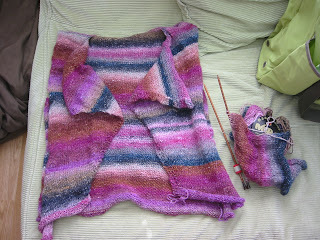 I'm currently knitting a sweater from Noro Unlimited by Jane Ellison. 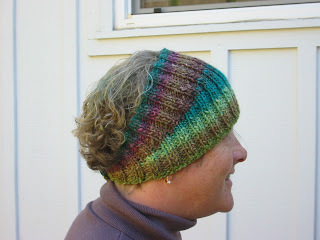 It's called Tithe and I'm knitting it in Silk Garden. The colour is slightly outside my usual palette - I thought I would go for a more pink colour - this is really very pink indeed! It's an easy knit - good television knitting - and going quite fast. Christina made me a hot-pad cover - see Sixties Retro. She thoughtfully provided me with a microwaveable pad to go in it. Some left-over fleece, half a pound of rice (tuppenny or otherwise) and about 3 minutes at the machine. Over the weekend I managed to get some sewing done. 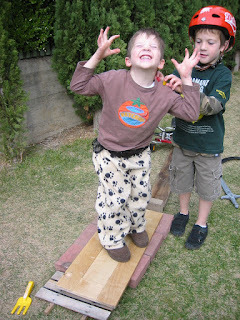 The boys played outside for hours: here they are building some sort of bike ramp to do "tricks". Finlay is modeling the dog pants. He chose the fleece fabric on a trip to Joanns for fabric paint before Halloween. He also chose some red plaid for Adam. I made these up using the same pattern as the skeleton pants, but I can't remember the pattern number. It's a basic pajama pattern. These are intended for skiing and camping trips, but Finlay had to wear his today. 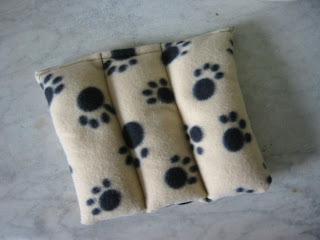 I've discovered the joy of sewing with Fleece; no seam finishing; no pressing; no fraying. I can see how you might end up with a wardrobe of home-made fleece clothes - apart from the obvious! 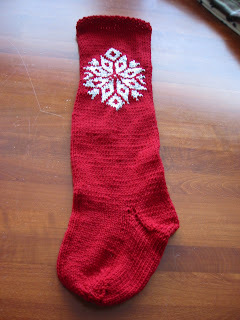 The other stocking of the pair. This one for Finlay. In Cascade 220 and the rest of the ball of Berocco Metallic FX. Thanks to a seaming lesson from Mary my finishing looks loads better. I'm hoping to put it into practise on my Tithe sweater which has a lot of seams to sew up. The weekend after Thanksgiving seems to be the traditional time to start to decorate your home for Christmas. In this neighbourhood most people go to town with lights and decorations so starting early gives you time to get everything illuminated! 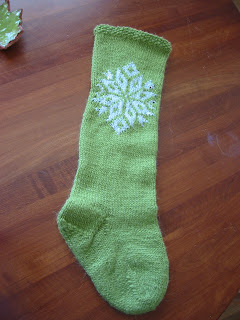 Here is the first of my Christmas knitting: stockings for the boys. This one for Adam. These will be for stocking presents so I made them longer than the pattern. 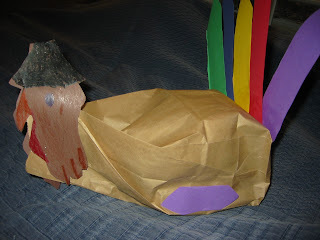 Adam made the turkey which contained a pottery spoon holder shaped like a leaf. 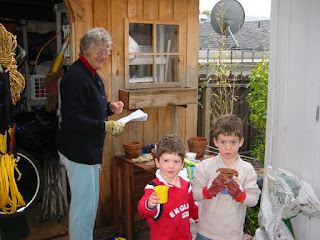 Both boys were able to tell us the story of the first Thanksgiving like the proper americans that they are. 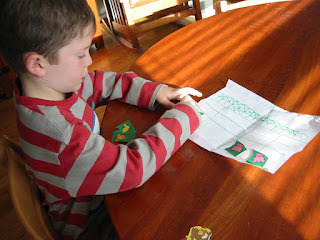 Finlay has invented his own board game. I actually don't know what it's called, but he and I played this afternoon. The rules are very complex, and seem related to Chess - you move pieces across the board in a similar way. Sadly I lost the first round to Finlay, but he did comfort me after announcing victory "well we both really won Mummy". I guess he's assuming that if I keep losing like that I won't want to play anymore. Behold my latest finished knitted object! (Well, actually not the latest - but one which is intended for me and can be talked about here). 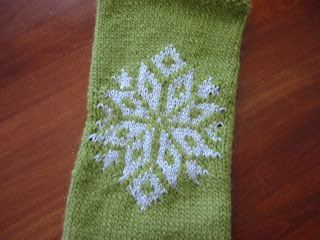 The pattern is calorimetry from knitty and I'm really pleased with it. Knitted from a single ball of Noro Silk Garden. Details for Ravellers here . Actually I think I just told all the details anyway. Its not a clear picture of my new green hair - but it does match the hat! 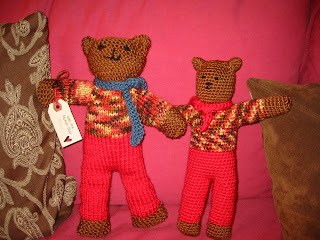 When Christina was visiting, at her suggestion, we made bears for the Mother Bear project. Mine, the knitted one, on the left, Christina's crochet bear to the right. 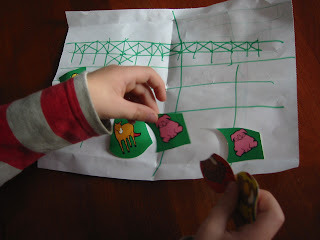 Its a nice sounding small-scale charity, but we were both appalled at the patterns that were provided for the bears. The construction was odd (both bears knitted/crochet in one piece from toes up to head and back to toes. There was no gauge suggested and the pattern was an odd mix of row numbers and inches... but don't let that put you off.... the odd pattern would be easy even for a beginning knitter, and the bears only took an evening to create. I also think they both came out really cute whatever the pattern limitations...and that is what counts. So, please, if you have a free evening, and the inclination, please look up http://www.motherbearproject.org/. 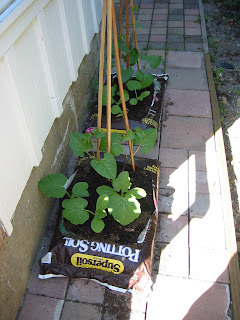 ..they brought them on inside, then planted outside in March. 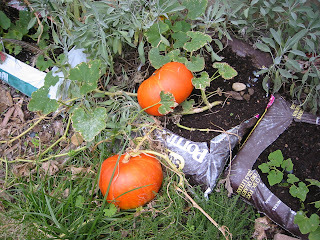 We harvested our pumkins for decoration over Halloween, and now are deciding how to eat them. Should we eat pie? or soup? mmm I forsee some baking over the weekend. Adam and I needed an adventure today - and we managed to find one here: Icerair 2007 . We had a blast! We started off in the village area cleaning up on stickers and made our way to the bmx park to watch the amateur competition. 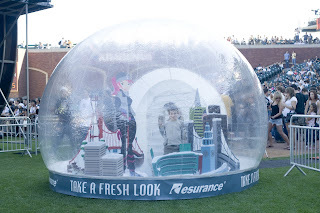 We then headed over to AT&T Park to watch the Big Air preliminary competition: Snowboard and Ski jumping from a huge snow-covered ramp erected in the stadium. It was a pretty exciting competition - we enjoyed the ski jumping better than the snowboards. We also watched some competitors practising for the pro skate and bmx Vert (20' high half-pipe for skateboard and bmx). After the competition we headed back to the village to watch the bmx professionals practise for a while before we headed home exhausted. While I prepared dinner Adam practised tricks on his 'bmx bike', aka the bike he got for his 2nd birthday...which has a suitable small scale to stand in. He tells me he is already saving for a bmx of his own! No digital photos - but we did buy a disposable camera so Adam will have some pics of himself being nearly brained by flying skateboards and flying cyclists.